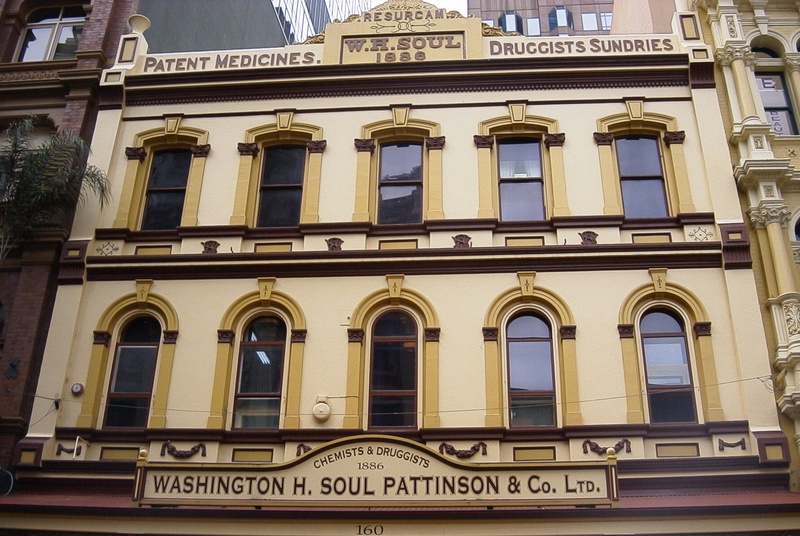 Washington H. Soul Pattinson & Co.
30 years after the City of Sydney was incorporated, in 1872, Caleb Soul relocated his rapidly expanding business from 177 Pitt Street to 158-160 Pitt Street. Unfortunately 14 years later, in 1886, the building burnt down. 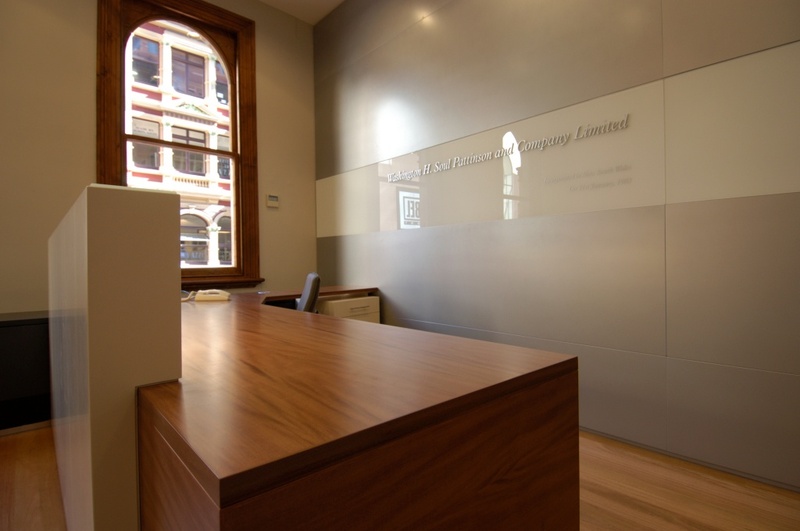 Although within a year the Phoenix Building rose again and Washington H Soul Pattinson & Co continued to trade at 160 Pitt Street. 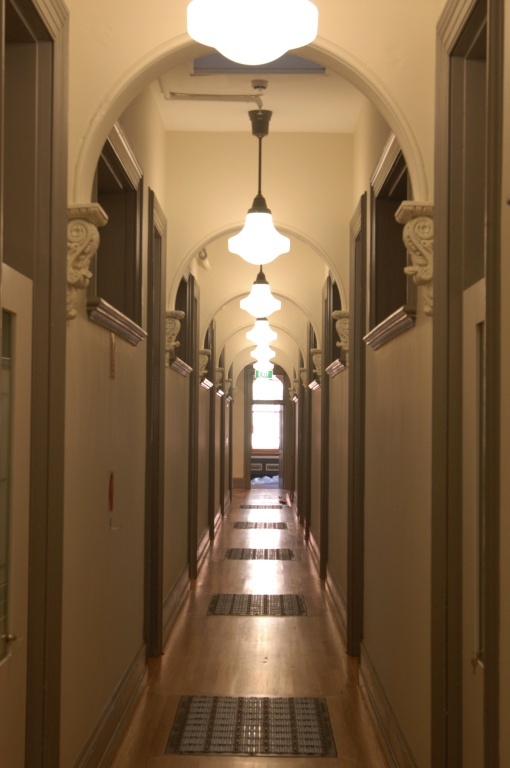 PCG’s brief was simple: the office interior, still laid out generally as per the original 19th century design, was to be brought into the 21st century whilst restoring and preserving all architectural design features identified as being of heritage importance. Our scope included the erection of a steel supported glass structure over the existing courtyard; installation of a new passenger lift; complete upgrade of mechanical, electrical, data, hydraulic and fire services; removal of introduced non original fixtures and fittings and the restoration of the “Clerestory” roof, floor lights and all existing original building fabric. Design ideals have changed dramatically since 1886, although not all one may argue, for the better. 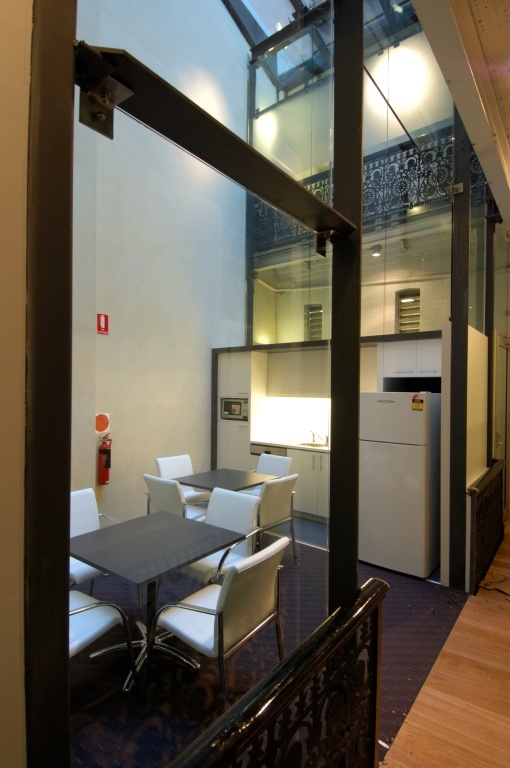 It was PCG’s intention to capitalise on the building’s opportunities whilst offering solutions for its constraints. High ceiling (3.6m) rooms were located off a long narrow central corridor punctuated by (curiously twisted) ornate archways. Framed glass floor blocks laid hidden under carpet, shaded by the corroded corrugated tin of the corridor’s timber framed roof, (referred to as “The Clerestory”). These features, when restored to their original design, facilitated two unique and extremely innovative properties of the building’s design. Despite mechanical air conditioning technology being in it’s infancy, the basic theory that cooler air is denser than warmer air was well understood. With this in mind the clerestory was designed to catch any passing breeze through its louvres and extract the warm air collecting in the apex of the clerestory roof. With the louvres, internal high level and perimeter office windows open air would freely circulate throughout the building. In the absence of electrical or even gas powered lighting at the time, sunlight was maximised wherever possible. 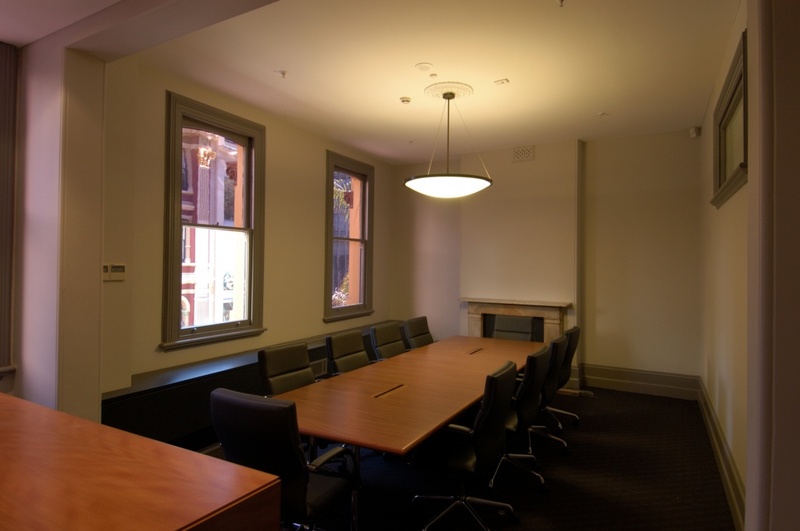 Evidence indicated that the Clerestory’s roof was originally sheeted with glass, allowing natural light to flood into the second floor corridor below, illuminating the offices through the high level windows. By placing glass blocks in the corridor floor, light continued penetrating down past the first floor into the ground floor chemist. 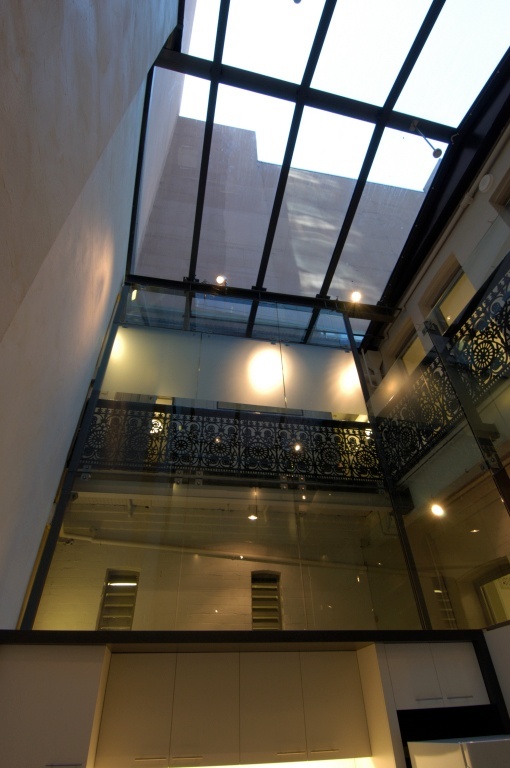 PCG’s scope incorporated the full restoration of both the iron framed, lead sealed glass floor blocks and the Clerestory roof, including the reinstatement of glass sheeting, (utilising the original iron glazing bars), and an operable louvre system. Due to the heritage listing of the building any proposed alterations to the existing fabric were closely analysed and evaluated. From a modern-day perspective, a less desirable feature of days gone by was the locating of all ablution facilities outside. 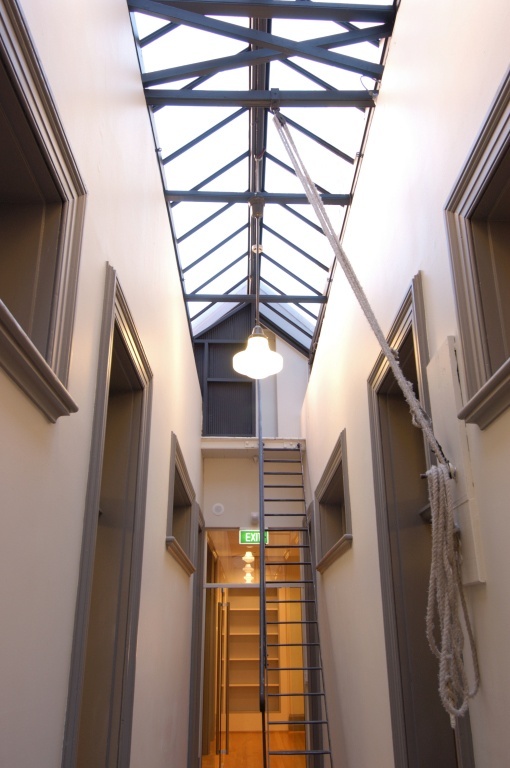 Access to Phoenix Building’s toilets were originally via a balcony skirting an external courtyard, (protection from the elements being a simple lean-to roof structure over the balcony) at the rear of the building. 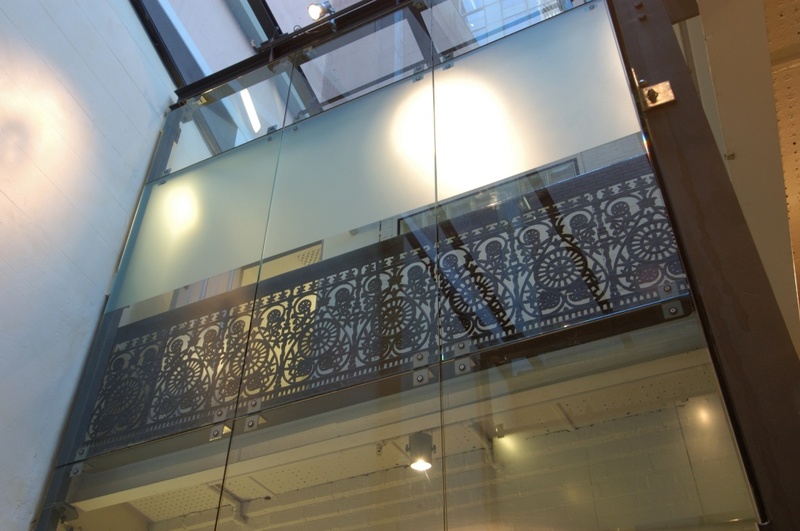 In conjunction with engineers and the heritage architect, a steel framed glassed structure was designed to preserve the original layout, (including the cast iron railing), whilst ensuring a more acceptable level of comfort was attained. Installation of mechanical and electrical services in a present-day building may be perceived as a relatively simple operation. In a building where above the floor it is generally deemed unacceptable to chase, penetrate or fix into walls and below floor joists tie into iron girders every 450c/cs, it is considerably more problematic. To overcome the restrictions while still providing services to the building, PCG designed and implemented a system of free standing “service sills” which ran around the perimeter of the building hiding all electrical, data, mechanical and associated water services.